Virginia Toledo and Jessica Geller of ID 810 Design Group sort out a super-size floor plan for a growing family's new home. ID 810 Design Group expertly divides an extra-long living space and adds color and sophistication to a young family's bare Brooklyn home. 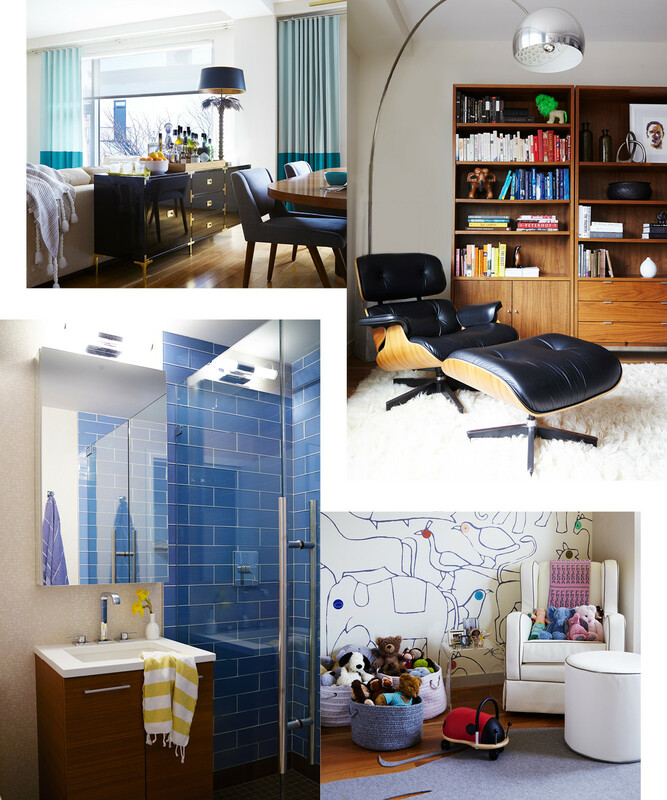 Many designers recall constantly rearranging the furniture in their childhood bedrooms or sketching layouts in their school notebooks as the earliest sign that they might just have a penchant for creating beautiful interior spaces. For Virginia Toledo and Jessica Geller, the business partners behind ID 810 Design Group, that most primal of designer instincts is what won them the job of decorating a lovely Brooklyn apartment with a confounding floor plan. 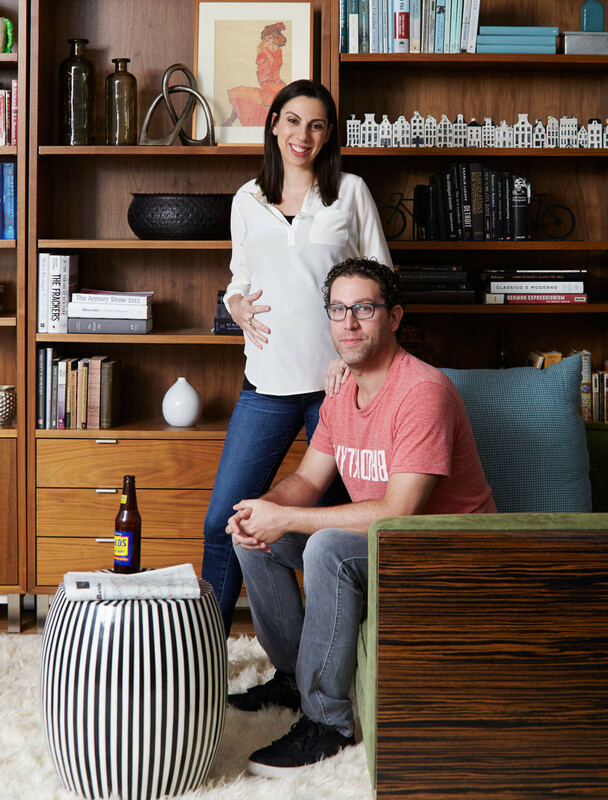 Homeowners Lana and Steven Kleimen in the multipurpose library-playroom area of their sun-filled apartment. 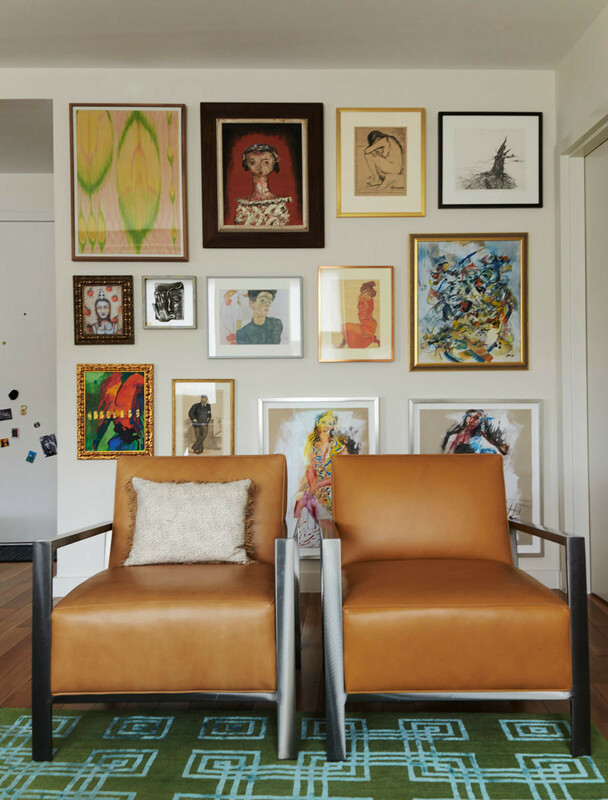 The couple's art collection, arranged gallery style, complements a sleek pair of Room & Board armchairs. When the pair first set eyes on the new Carroll Gardens three-bedroom of Lana and Steven Kleiman, it was still largely a construction zone with bare concrete floors and no kitchen to speak of. What it did have in abundance were two qualities New York City house hunters don't often find themselves confronted with: light and space. And lots of it. Before the drywall dust had settled it was clear to the homeowners that the sprawling living area that had first attracted them to the unit now had them far out of their depth design-wise. "The main space was way too big to devote half to living and half to dining, or even two thirds to living and a third to dining," explains Toledo, of the glass-walled expanse that separates the home's master suite at one end from two bedrooms and an office at the other. Lucky for the Kleimans, on that first visit Toledo and Geller's space-planning senses were already devising an atypical solution that would accommodate evenings in, entertaining, and in a fateful twist, a cozy play area for the little girl they found out they were expecting mid-makeover. 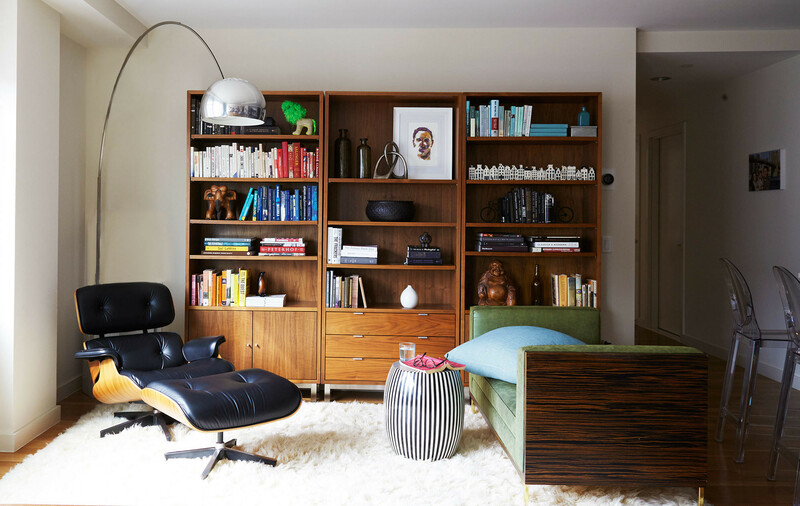 A classic Eames lounge and vinyl-upholstered daybed are complemented by a punchy, striped garden stool and color-coded bookshelves. Two-tone curtains, cool blue tiles, and artsy animal print wallpaper are just a few of the designers' clever uses of color in the mostly neutral home. The plan called for a TV-centric lounge space at one end, a library-playroom at the other, and a spotlight-stealing dining area floating in the center. 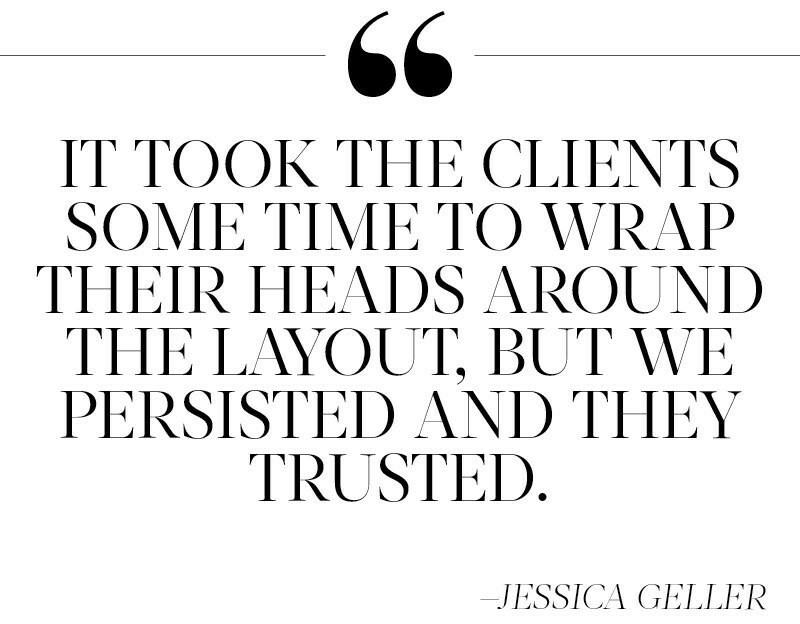 "It took them some time to wrap their heads around our proposed layout," says Geller, "but we persisted and they trusted." An extra deep Edward Ferrell + Lewis Mittman sectional defines the primary seating area, which also features color-blocked curtains and a bold rug in a modified Greek key motif. A deeply personal art collection comes together in a gallery-style arrangement behind a pair of leather-and-chrome armchairs from Room & Board. "Steve and I have collected the art pieces throughout our entire relationship from different places in the world we've traveled to," explains Lana. The mask and the two ladies nearest the floor are from Israel, the parrot from Costa Rica, and the woman in the wooden frame from an antique store in the Hudson Valley. The Picasso print, in the top row second from the right, was a gift from Lana's father, who is an artist. Fresh whites and rich wood tones, as seen in the nursery, master suite and entryway, lend a sense of polish and quiet sophistication throughout. At the far end of the space, rich wood bookcases anchor what started out as a sleek library and, with the arrival of now two-and-a-half-year-old Frieda and the addition of a cozy shag rug, has morphed into a flexible playroom. In the center of it all, a stately Altura Furniture dining table is framed by Modshop chairs, and a bar cabinet topped with a vintage palm tree lamp that belonged to Steven's grandmother. "Having a special dining table that was an investment piece and they could have for years to come was a priority," says Geller. The custom light fixture above expertly conceals the designers' second greatest challenge. "The architect only provided one overhead light and it was in a very awkward location," explains Toledo of the placement in a pass-through to one side of the table. "Unfortunately, in the city you are limited by concrete ceilings and can’t simply relocate a light." The pair's creative solution? A custom fixture that draws power from the off-center source and extended across the dining area like a glowing art installation. The master bedroom and nursery carry on the home's lush color palette and urban-sophisticate air. The former features a tufted headboard and custom vanity with a faux-fur stool from Clayton Gray Home. The latter, crowned by sunny yellow awning stripes on the ceiling, incorporates a Made Goods tree branch pendant and an elephant-shaped rug from Fitz Felt. With baby number two due to arrive any day—Geller and Toledo back at work on a new nursery—there's no doubt that the super-sized heart of this home will be put to good use for years to come.